Some books are not for everyone. But some books are exceptional in their sub-genre. Children of the Dark is one of those books. How would ordinary people react in an abnormal situation? And how abnormal can a situation become? These are two questions you’re going to have to ask yourself when reading Children of the Dark. I so want to include a mini-spoiler here, but I’m holding back because I want you to read this book if you’re a Laymon fan or a fan of splatterpunk fiction. Did I like it? No, I didn’t. I don’t like books with characters who don’t act like I would act in the same situation. I don’t like a lot of Laymon’s books for the same reason. Nobody acts like Richard Laymon’s characters act. Would I recommend it? Absolutely. Why? Because the characters don’t act like I would act in the same situation. Does this make sense? Dunno. Makes sense to me. How would you act if a guy you know turned into a subterranean creature while you were in a jail cell and you couldn’t get the deputy to look at him despite your screaming “Look at him!!”? (Okay--mini spoiler). 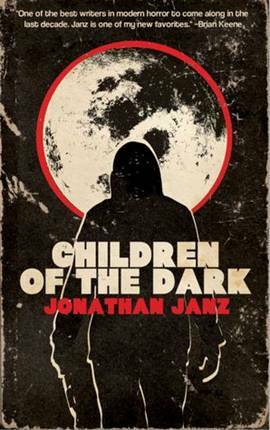 When you go this far “out there” in a novel, like Jonathan Janz did in Children of the Dark you’re looking at two options: people are going to love it or people are going to hate it. I think you should read it whether I liked it or not and THAT’S the reason for the 3 stars. If you can put yourself in the mindset of the completely unbelievable situations the characters find themselves in, you’ll have a glorious ride. If you can’t, you’ll hate it. I’m being as honest as I can be here. I do not know what I think about this book. But I think it’s well worth a read.